It is an ongoing incident. ONE US POLICE officer has been shot dead and four of his colleagues have been injured in a mass shooting in Denver, Colorado. Large areas of Douglas County were closed off during the incident. Police in the region ordered people to leave the area. A police spokesman confirmed that deputies responded to a domestic disturbance which resulted in shots being fired. Five were shot with one confirmed dead. Two civilians were also shot by the suspect, who officers shot and believed to be dead and no longer a threat. A series of tweets from their official Twitter page initially informed the public of the incident. 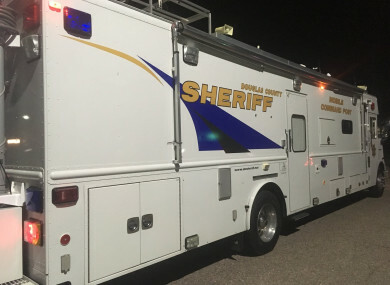 They read: “Douglas County Sheriff’s Office (DCSO) is working an officer down call in the area of County Line Rd between Colorado Blvd and University Blvd. This is an active event, please avoid the area. A Code Red was sent out regarding this incident. Any citizens in the affected area are instructed to shelter in place, avoid windows and stay away from exterior walls. Email “'We have multiple deputies down': One police officer dead and four injured in US shooting”. Feedback on “'We have multiple deputies down': One police officer dead and four injured in US shooting”.